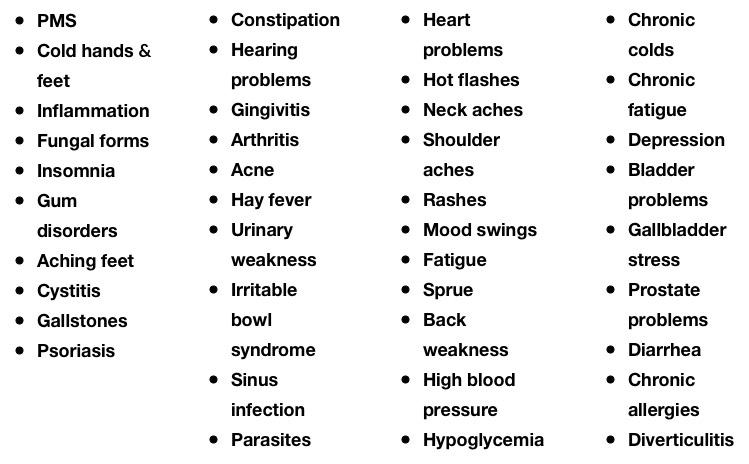 Enzymes are needed for every chemical reaction that takes place in your body. They are connected with every working organ and facilitate all metabolism. Science has identified over 5,000 enzymes and there are thousands more yet undiscovered. They are biocatalysts, making internal chemical reactions work faster and more efficiently. Food enzymes are found in raw foods. There are sufficient enzymes in each raw food to digest it. The level of active enzymes in a food is affected by food additives, radiation, long term storage, and any kind of food processing, especially heat. Enzymes in foods are destroyed when they reach a heat over 116°. Digestive enzymes help break food down into basic components so you can absorb the nutrients that are required to build cells, maintain organs and repair tissue. These enzymes are present in the digestive juices your body produces, starting with the saliva in the mouth continuing down to and including the intestines. They include protease, amylase, lipase, malt diastase, invertase, lactase, pectinase and alpha galactosidase. These enzymes break down different food groups. Metabolic enzymes enhance and support metabolic processes. They are made by the body and drive chemical reactions within the cells. On the cellular level, enzymes direct body systems and are interconnected with every functional organ and biological system in the body. Supplemental enzymes are cultured from plant enzymes. Plant enzymes are grown from food such as mushrooms, soy and wheat in a laboratory setting with specific actions rendered in units. They are nonpathogenic Aspergillus Niger species and are free of mycelium contamination. Removal of all aspergilli and fungi leave only the enzymatic action. Supplemental enzymes are a concentrated form of enzymatic action. Why do I need Digestive enzymes? We are all born with an enzyme potential. Raw food contains its own enzymes for digestion, but cooking and processing destroys them. The body then needs to make its own enzymes to metabolize food. Over time the body runs low on enzymes, therefore the various digestive and cellular processes slow down. Because of this, many chronic conditions can result. By taking enzymes, you are allowing your body to put energy into maintaining and repairing vital organs and tissues rather than siphoning it off to create enzymes to digest your food. What should I expect when I start taking enzymes? Everyone does not experience the same reactions. Most people start feeling better within a few days, especially in terms of digestion and elimination. By improving absorption of nutrients, the body is better able to detoxify itself. In addition, yeasts, bacteria and parasites may start to die off and initially it may be hard for the body to dispose of them quickly. For some people, that means that they may feel a little worse before they feel better. Symptoms could include headache, “flu-like” feelings, and fatigue or skin rashes. This is actually a good sign! Your body is starting to clean house! You can lower your dosage to control the symptoms, keeping in mind that improvements will also come at a slower pace. Make sure to drink plenty of water! How do I understand how to read the label? What does HUT, SKB, FIP, etc. mean? How do I compare enzyme products? There are a number of enzyme supplement products on the market today. Only by analyzing the contents’ labeling to compare products, can you be sure you are getting the best product available. “Commercial enzymes” are one product you may come across. Commercial enzymes are of a lesser grade and purity than pharmaceutical enzymes. They are less expensive to produce. They are also less potent. Enzyme Research® uses only pharmaceutical grade enzymes! Another to watch for on the label is fillers. Fillers can be many things including leftover fibers or cellulose. Magnesium stearate is often added for no other purpose than to help the production machine move at maximum speed. Enzyme Research uses NO FILLERS in any of its enzyme formulations. Looking at the label of an Enzyme Research product, you will find measurement units you may not be familiar with. These are from the Food Chemical Codex (FCC). The FCC is published by the National Academy Press and is the accepted standard of the Food and Drug Administration. The system for determining enzyme potency used by the American food industry is derived from the FCC. This is the ONLY National Standard for evaluation of plant enzymes. This system establishes activity levels and potency for enzymes. With most foods, we are used to comparisons based on weight (mgs.). With enzymes, we are interested in the activity and potency available. There is no direct relationship between weight and units of activity (HUT’s, etc.). The enzyme activity of all Enzyme Research products is measured and reported in FCC units. Every product batch is assayed to ensure the product contains what the label states. When comparing enzyme products, make sure measurements are listed using FCC standard codes. Some manufacturers make up their own abbreviations. Others use weights such as milligrams (mgs.). Because of the variety of labeling formats used, it is important to read carefully and make sure you are not comparing apples to oranges. Amylase assists in the digestion of starches. Protease assists in the digestion of proteins. Lipase assists in the digestion of fats. Lactase assists in the digestion of milk sugar. Invertase (sucrase) assists in the breakdown of table sugar. Maltase assists in the breakdown of large starch-derived sugars commonly found in the diet. Pectinase with Phytase assists in the absorption of minerals. Alpha-galactosidase assists in the digestion of beans and legumes and helps prevent the undesirable effects produced. Will enzymes interfere with my medications? It is unusual for there to be an interaction between a medication and enzymes. If you are taking a time release formula, be aware that some use cellulose to slow digestion and release of the product. In that case, you would want to be cautious with your use of cellulase. If you are taking a blood thinning medication, you would want to be cautious with your use of nattokinase and protease. Enzymes heal the gut and improve absorption, so you may be metabolizing more of your medications and supplements than in the past. Be knowledgeable about the side effects of your medication and monitor any increase of them as you begin enzymes. It may become possible to cut down or eliminate that medication. As always, please consult with your health care professional. Are enzymes safe for children? Enzymes are safe for infants on up. It is easy to break apart capsules to mix in water, juice or applesauce. How pure are your products? What about allergens? Enzyme Research uses only the highest quality pure pharmaceutical enzymes. All ingredients in our formulas are rigorously tested by our encapsulator for heavy metals, pesticides and other contaminants. This story gives you an idea of the integrity of our encapsulator – Dr. Lori, owner of Enzyme Research sent over a new formula. The encapsulator called her and said there was one ingredient for which he could not find a source pure enough that would satisfy him. That ingredient was left out. Prodophilus has traces of milk products. In this case, the probiotics are grown on a dairy-based culture and then centrifuged to separate the culture from the probiotics that go in the bottle. Glucosamine/Chondroitin/MSM contains shellfish. Glucosamine is made from shellfish, but there is no evidence that it contains shellfish proteins which are usually responsible for causing allergy symptoms. There is a vegetarian form of glucosamine which has less efficacy. Anyone with a shellfish allergy would want to check with their health care professional. Vitazyme –according to FDA standards the following allergens must be listed, though they are not all an issue as we understand it: wheat, soy, dairy and shellfish. The wheat in the formula is from wheatgrass which does not contain gluten or gliadin and therefore should not cause any problems. The soy is from the Betatene (vitamin A), the Vitamin E, manganese, molybdenum and selenium. The Betatene and Vitamin E are allergen exempted because the soy is there at the start of manufacturing, but becomes a non-issue by the end. The three minerals are chelates which do contain soy. The dairy is used as a carrying agent in the Acerola Extract. The shellfish is in the glucosamine (see above explanation). Nattokinase with Herbs contains soy. The soy is fermented to grow the enzyme. The enzyme is separated from the growth medium at the end and should not be a problem. The malt diastase which appears in several products is derived from barley used in the fermentation process. By the end of that process, it should be used up. However, we cannot state conclusively that it is gluten free. What are the pros and cons of plant and animal enzymes? Animal enzymes, or pancreatic enzymes, are from the pancreas of a slaughter house animal. Ask yourself “What was the condition of this animal and its organs before it was slaughtered?” How does anyone know? Don’t forget the importance of pH balance. Pancreatin only works at a 7-9 pH range. Plant enzymes have the capability to work between 4 and 11 pH. They are blended as neutral, alkaline and acidic in our formulations to make sure enzyme activity can occur in a wide range of circumstances. This means they work throughout the entire digestive tract and in the blood. Will taking supplemental digestive enzymes keep me from making my own? Hormones are the signals for turning enzyme secretion on and off. Taking digestive enzyme supports digestive function, it does not inhibit it. By taking supplemental enzymes, you are giving your body more energy to put into other important bodily functions besides digestion. Enzymes are proteins which will be broken down into amino acids and absorbed by the body if not used up. There is no instance of anyone having been harmed by taking too many enzymes. However, during initial use, large amounts of enzymes may provoke a cleansing reaction as the body releases toxins more rapidly than the body can process. Can enzymes help with weight loss? Research has shown that obese individuals are deficient in the enzyme lipase. Lipase is the enzyme that breaks down fat. Lipase helps us burn fat for energy. Without it, fat is stored or accumulates in arteries. Additional lipase should be taken with meals containing fat along with a general digestive enzyme. Many overweight people have metabolism imbalance or will soon create one. The endocrine system is our metabolism. Hormones are the driving force of the endocrine system. Hormones are made from fat, so properly digested, healthy fats such as raw butter, nuts and seeds and fish oils are essential. Healthy fats satisfy the appetite and help us keep going longer without snacking. Don’t exclude fat from your diet, but make sure it is an uncooked, healthy source and you have sufficient lipase to digest it.